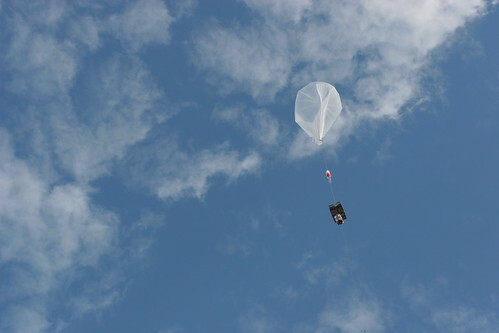 The University of Tennessee Amateur Radio Club (UTARC) has launched their latest balloon "The Spirit of Knoxville IV". It took flight late last night on its voyage across the Atlantic Ocean, into Europe, via the swift moving winds of the jet stream. The team put a computer and GPS on board to transmit the balloon's location and altitude via ham radio. The data stream is sent out via RTTY and CW at ~10.146 MHz. The data is displayed in rather raw format here and in a more presentable flash-based "dashboard" which features a Google Maps fix on the balloon's last reported location. Quite a few people are monitoring the balloon so the site is a bit slow to load, but to track the little autonomous balloon is pretty neat. Right now, as I write this, it's zipping along at 111mph @ almost 40,000ft out over the Atlantic. update: The balloon fell short of its European goal. The payload splashed down about 2:00pm CST, 425 miles southwest of County Cork, Ireland. The balloon began losing altitude the night before and never full recoverd. The decent was partly caused by the loss of sunlight heating the gas in the balloon and/or icing on the surface of the balloon. "Grams will make/break you in this business," one UTARC member said. 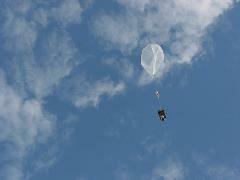 The balloon's exact location was unkown as radio contact was lost at about 1:51pm CST. Better luck next time guys! Page generated for 3.90.56.90 in 0.01531 seconds.